As the holiday season approaches, our thoughts are naturally drawn to the traditional holiday meal. And what would this festive meal be without the "tart little cranberry"? For, as we all know, it is this delicious fruit which spices up the flavor of the turkey. We can also thank the cranberry for adding that happy, colorful touch to the decorated dinner table piled high with the foods we always enjoy during this time of year. With a great deal of luck and pluck, the tart little cranberry has risen from the very humblest of origins—a swamp, no less—to occupy a place of honor on almost every holiday table in America. Cranberries are now as American as, well, apple pie, especially at Thanksgiving. Although there is little evidence that cranberry sauce was served at the first Thanksgiving, it has always been assumed that Indians brought it to this famous feast; this has become a staple story in the American history of cranberries. Since this native fruit grew wild in the Northeast, early settlers followed the Indians' lead, making the berry their major source of vitamin C. Although fairly low in calories (46 calories per 100g) and carbohydrates (11%), they are a good source of fiber and a fair source of potassium. Early records show that the berries most likely had a place on the American table right from the beginning. "The Indians and English use them much," wrote John Josselyn, who visited New England in 1663, "boyling them with Sugar for Sauce to eat with their Meat, and it is a delicate Sauce." Other accounts mention the Indians cooking cranberries with maple sugar or honey, using the fruit as a source of dye, and even as medicine, pounding the berries into a pulp that was spread on wounds to "draw the poison out." Cranberries also travel well, and subsequently, colonial ships carried barrels of cranberries on long voyages as a scurvy preventive for the crews. In the days of the great sailing ships American cranberries used to be exported to Europe. Simply packed in barrels and covered with water, they would remain in good shape through a long sea voyage. Why are they called "cranberries"? Some say it is because of the crane shape of the fruit's flower. More probably and practically, if less poetically (why bother about the flowers? ), it is because cranes (which used to be common in Britain) and cranberries are both at home in bogs. There are two main sorts of cranberry: the European cranberry which grows wild on moors all over northern Europe and Asia, as well as in North America, and the American or large cranberry, which is naturalized locally in Europe, including parts of Britain. In America, it grows wild from Newfoundland south to North Carolina, and westward to Saskatchewan. It is the American cranberry which is cultivated, because it has larger fruits—up to 3/4" in diameter, compared to the 1/3" of the European species. 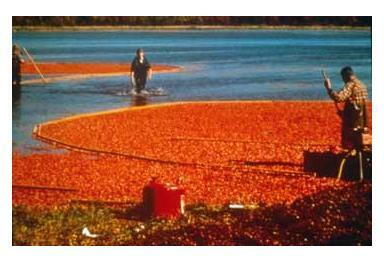 Cranberry growing is centered in Massachusetts, with Cape Cod producing 70% of the total. Cranberries are also known as "bouncing berries" because the good ones bounce. In the old days, they were tipped down steps; the bad ones remained on the steps because they did not bounce. Modern grading machines use the same principle, each berry having seven chances to bounce over a four-inch barrier. Cranberries, like the related bilberries and blueberries, tend to grow naturally in what would otherwise be wasteland. For cranberries, the magic combination seems to be acid, sandy bog, wasteland and water. It is believed that commercial cultivation of cranberries was begun in the early 1800s at Dennis, Massachusetts, by Henry Hall, who observed that an abundant amount of large fruits were produced when prevailing winds and tides swept some sand into his bog. A moderate amount of sand in the bog helps to stifle the growth of weeds without interfering with the cranberry plants, because the latter have deeper roots. Cranberries were once a gift to be had for the picking, and cranberry gift items are available at the New England Country Cupboard in Massachusetts, near Cape Cod. There are two methods of harvesting the cranberry—wet and dry. In dry harvesting, a mechanical picker with metal teeth combs the berries off their stubby vines. Berries picked by this method supply the fresh market, which accounts for about 15% of the crop. In wet harvesting, the bogs are flooded with water, then worked over by giant "eggbeaters." The berries float to the surface and are collected, then taken to the processing plant to be turned into sauces, jellies, or juices, or simply dried. To learn firsthand how cranberries are harvested you can visit the Cranberry World Visitors' Center in Plymouth, sponsored by Ocean Spray and located near Plymouth Rock. You can take a tour of a demonstration bog and taste some of the many cranberry concoctions emerging daily from the Ocean Spray test kitchen. "Until they come here, most people think cranberries grow in the can," says Janice Hogan, an employee at the center. Most species of cranberry are quite tart and require liberal amounts of sweetener to make them palatable. Hence, the inadequate supply of sugary substance may have been a factor in the limited utilization of this fruit until the development of the beet sugar and cane sugar industries in the late 1800s. Although it slowed widespread popularity of cranberries until the nineteenth century, the lack of refined sugar did not prevent the cranberry from becoming part of the American cooking style. In fact by 1864, a year after Lincoln proclaimed the first national Thanksgiving Day, General Grant, still holding Petersburg under siege, ordered a great shipment of cranberries so that weary soldiers could celebrate a traditional Thanksgiving properly. The future president seemed to know that what might be needed most of all at just that psychological juncture was the taste of a purely American heritage. However, since the fruit still appeared on our table only once or twice a year as part of the supporting cast for "The Bird" or other special occasions, consumption soon reached a plateau and remained there for many years. The situation improved markedly when various cranberry juice drinks were marketed in the 1960s. As a result, there is now a fairly steady consumption of the fruit throughout the year, and juice drinks have become the best-selling cranberry product. Even cranberry hard candies (called Fruitwaves) have appeared on the American scene in recent years. Fresh cranberries can be stored in a refrigerator for several months, or they may be kept frozen for several years with only minimal loss of moisture. Feel free to freeze several bags of fresh cranberries to ensure a year around supply. Be careful, though. The frozen berries become very soft upon thawing and should be used immediately in order to prevent spoilage. This year why not try something different? Try serving the tart little cranberry for dessert. The following are some of my favorite recipes. 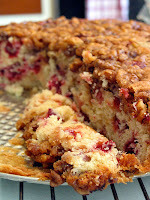 You can try them as soon as fresh cranberries appear in your nearby market. Preheat oven to 350 F. Butter and flour 10- to 12-cup bundt pan. Sift cake flour, cornmeal and baking powder together. Cream butter, 3 cups powdered sugar and brown sugar in a large bowl until fluffy. Beat in eggs one by one. Add the vanilla. Mix in the dry ingredients alternately with the milk, beginning and ending with the dry ingredients. Stir in the ground almonds and cranberries. Transfer the batter to the prepared pan, smooth the top with a spatula and bake until golden— about 1 hour. Cool 10 minutes in the pan on a rack then turn out onto a rack to cool completely. Dust with sifted powdered sugar, cut in slices and serve, garnished with mint leaves. In a large pan combine all the ingredients and stir together. Bring the mixture to a boil, stirring constantly. Simmer, uncovered, over low heat for 15 minutes, stirring occasionally, until slightly thickened. Tarla, is the photo of the same cake as the recipe makes? The cake in the photo doesn't appear to have been baked in a bundt pan, and the topping on it doesn't look much like a cranberry macadamia nut chutney?